Atomic Luau battles Rotter Studios in never-ending Star Wars debate. As the internet continues to burn with debate over whether or not Star Wars: The Last Jedi was good, YouTuber and friend of the Atomic Luau, Steve Rotter of Rotter Studios took a moment to Skype his concerns in lively (and hilarious) discussion with DJ Mondo. A life-long (and quite emotional) Star Wars fan, Steve aired his concerns over characters, plot points, Disney and (for some reason) Batman while DJ Mondo acted as therapist. Check out the conversation in the video below (SPOILERS!). When you’re done, go to Steve’s YouTube channel for more funny content. 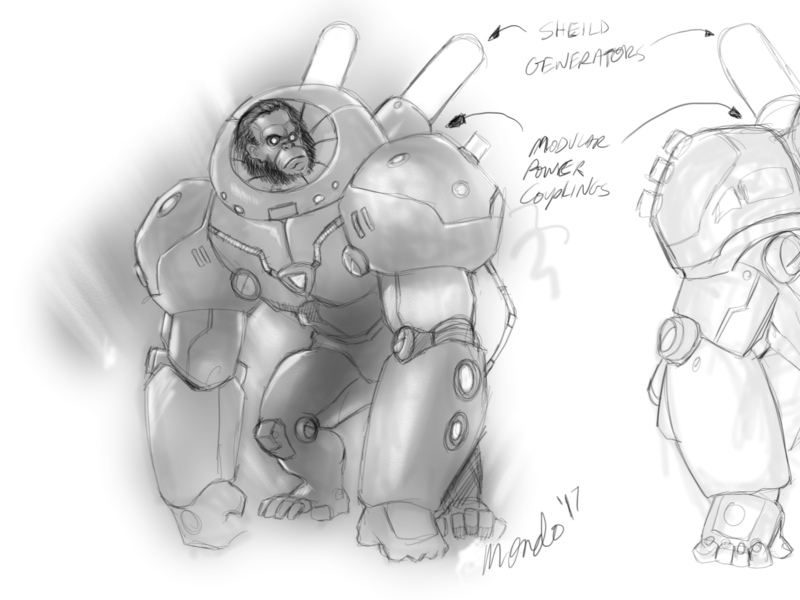 DJ Mondo’s robot gorilla companion sits for quick sketch. Looks cranky from lack of sleep. The image-enchancing eye implants, while practical, don’t make his appearance more pleasant.